Falk (wrist) was placed on injured reserve Friday. Analysis: Falk, who was picked by the Titans in the sixth round of April's draft, still hasn't suited up for an NFL game. He'll be sidelined for the remainder of the season unless he reaches an injury settlement. Falk (wrist) has been ruled out for Sunday's game against the Bengals, Adam Beasley of the Miami Herald reports. Analysis: Falk was a full participant in practice this week before being held out of Friday's session with an apparent wrist injury, but the Dolphins offense won't miss him in Week 5 with Ryan Tannehill drawing the start at quarterback. If Tannehill were to go down, however, Brock Osweiler and David Fales are slated to provide additional depth. Falk is a healthy inactive for Sunday's season opener against the Titans, Adam H. Beasley of the Miami Herald reports. Analysis: The rookie won't suit up against the Titans, who picked him in the sixth round of April's draft. Instead, Brock Osweiler will serve as Ryan Tannehill's backup. Falk was claimed off waivers by the Dolphins, Albert Breer of TheMMQB.com reports. Analysis: Falk was recently waived by the Titans after Tennessee snagged the former Washington State quarterback with a sixth-round pick in this year's draft. 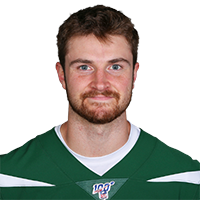 Now with the Dolphins, Falk will compete with Brock Osweiler and David Fales for the No. 2 job behind Ryan Tannehill. Falk was waived by Tennessee on Saturday, Tom Pelissero of NFL.com reports. Analysis: If Falk clears waivers, there's a chance he'll latch onto the Titans' practice squad. The 23-year-old possesses his fair share of upside after being a standout at Washington State.